Oregon is a beautiful state but it takes a long car ride to find that beauty. 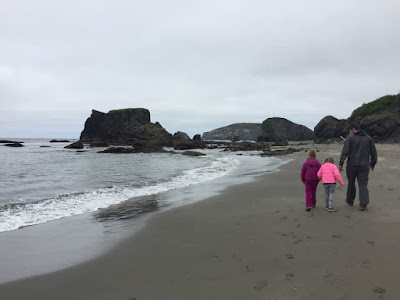 We drove 14 hours from Calgary to Madras, OR plus we also stopped for lunch, Target and Nordstrom Rack so it felt like a super long and boring day and it was for sure. 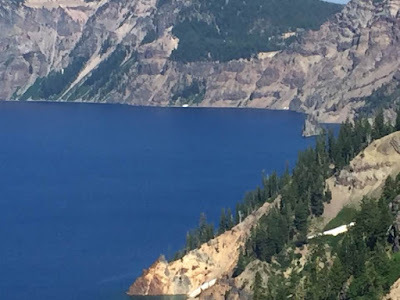 But once we left Madras the following day and made our way towards Crater Lake National Park, it was much much better. Also adding to the boredom of the drive was car problems that were showing their faces in the middle of nowhere on our drive. At this point, our drivers manual was telling us that we could keep driving so that is what we did. Not that we really had a choice considering where we were haha. 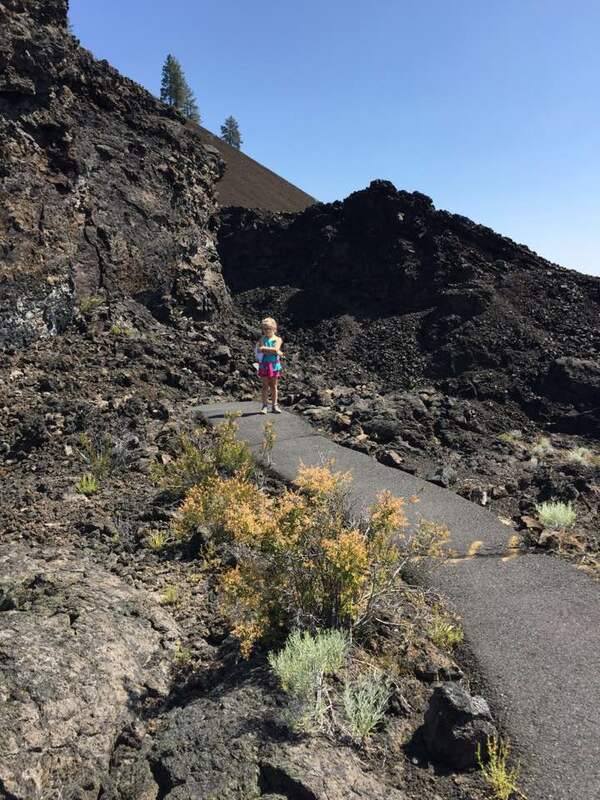 We made a stop at the Lave Butte Visitor Centre which is home to the Newberry Volcanic National Monument. We took the bus from the parking lot to the top of the volcano and then we hiked around it. We had done this 5 years ago but neither kid had any memory of it. There is also a fire lookout at the top of the summit and is one of the busiest in the Pacific Northwest. 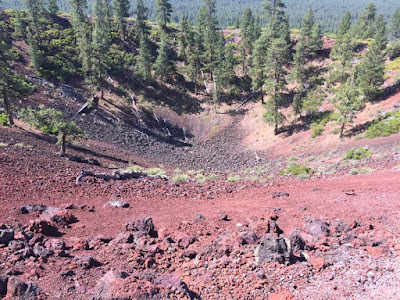 Newberry Volcano is a shield volcano with a caldera at its summit. It is one of the largest volcanoes in the lower 48 states. It covers an oval area of about 600 square miles. It's highest point, Paulina Peak, stands at 7985 feet. Lava flows and cinder cones make up about 75% of the volcano, while the remaining is ash, air fall deposits and sediments. We took the bus back down to the bottom of the volcano and hiked the Trail of the Molten Lava so we could get an up close look at the vent of the volcano. 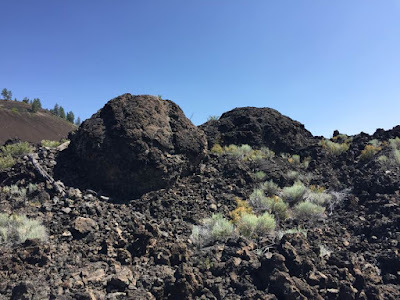 These are called snowballs of lava and they start as just small chunks of molten rock. As these pieces broke off the sides of the molten river channel, they rolled and tumbled through the flow, growing in size as they moved. Much like a snowball rolling downhill and growing larger as more sticks to it. 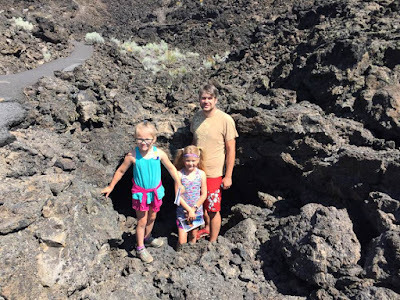 Greg and the girls in front of a lava tube. A lava tube is a natural conduit formed by flowing lava which moves beneath the hardened surface of lava flow. Tubes can be draining lava from a volcano during an eruption, or can be extinct, meaning the lava flow has ceased and the rock has cooled and left a long cave. Here is penelope inches away from the viewpoint we were hiking to. She refused to move past this point. After we left the visitors centre and the girls received their junior park ranger badges, we drove down the road to the Lava River Cave. Basically it is a deep dark cave that has bats in it. 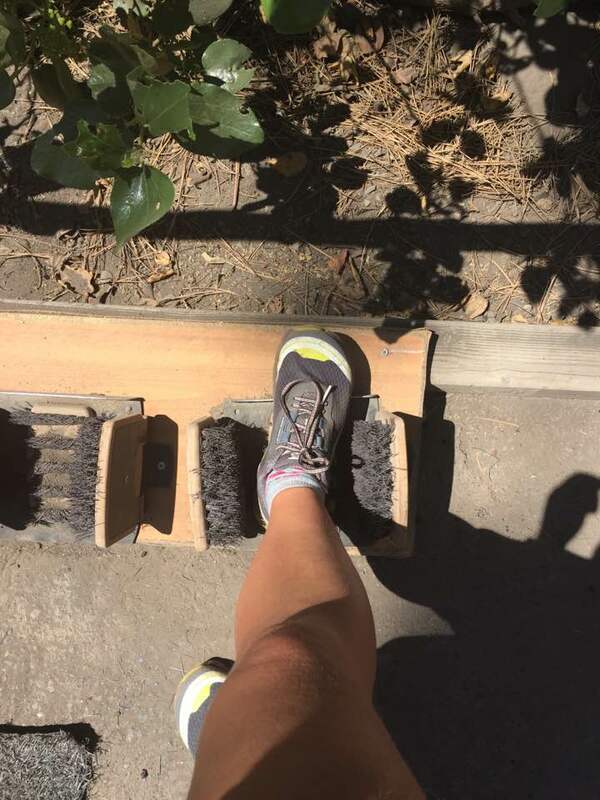 Because of some disease that could cause bats to die, we had to clean our shoes both before entering and leaving the area. They considered this cave to be contaminated and if you go to this cave then you can't go to another similar cave wearing the same shoes or clothes. 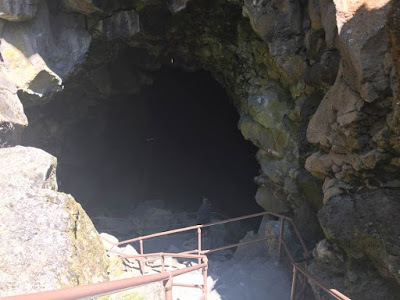 This is the entry to the Lava River Cave, which is an excellent example of a lava tube. It is 5211 feet in length and completely dark. When we were here 5 years ago, Finley made it to the bottom of these stairs before turning around and Penelope went all the way in with Greg. This year it was the opposite. 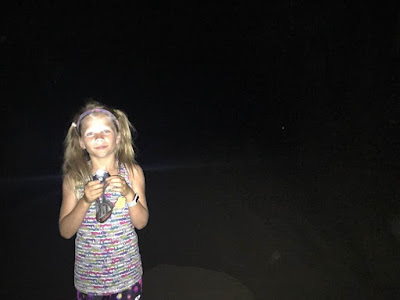 Finley and I went all the way into the sand walls and then made our way back. 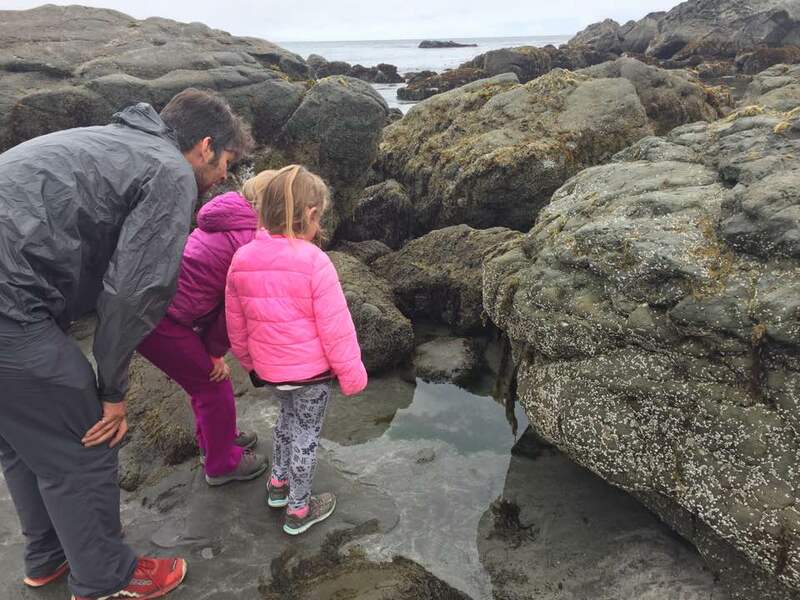 Greg got Penelope to go further in then Finley did 5 years ago but still not as far as us. This is Finley in the cave. We had her shine her light on her face and had my flash on to get a photo. No other photos turned out but it was one of the coolest things I have ever been in. We didn't get to see any bats though. 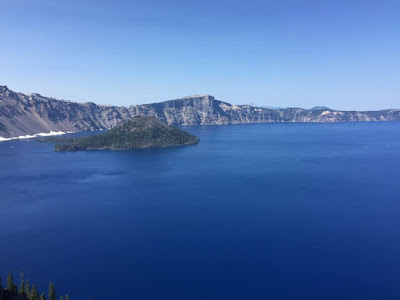 Eventually we made our way to Crater Lake, our destination for that night. Greg and the girls at our first viewpoint overlooking Crater Lake. It is one of the most beautiful places I have been. 5 years ago when we came here for the first time I had never heard of it. Now I will never forget it. 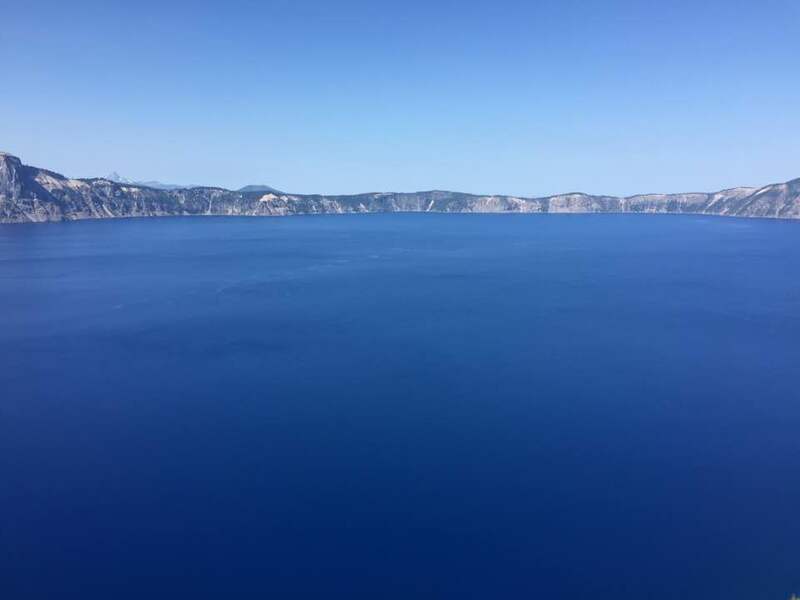 The water is all from snow and rain and is the bluest you will ever see. 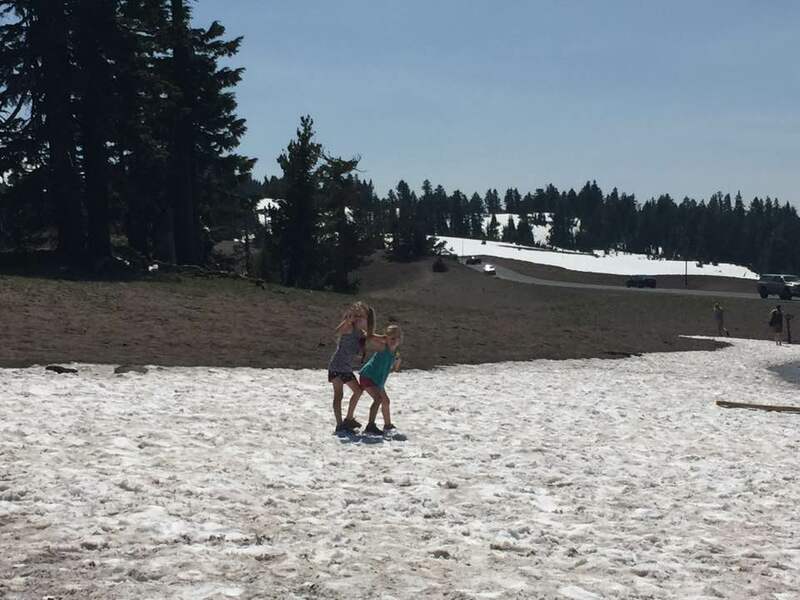 Crater Lake got 5 more feet of snow then they usually do and so their summer was about 6 weeks behind they figured. There was still snow everywhere and they had mosquitoes the size of bumblebees. It was insane. Everybody seemed to love the snow though. 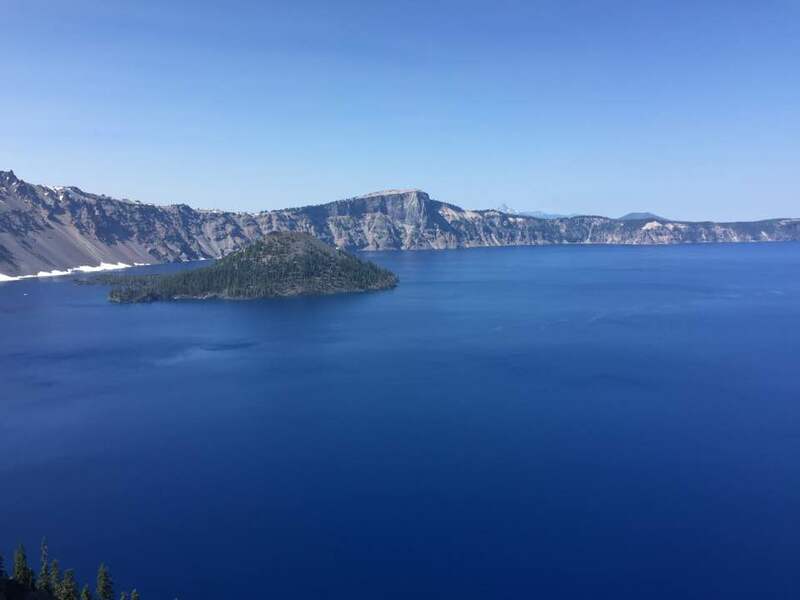 The girls participated in a junior ranger program learning about how Crater Lake came to be. Finley loved it very much. Penelope loved watching her cougar "die" when the volcanoe erupted. Wizard Island is a volcanic cinder cone which formed an island at the west end of Crater Lake. The top reaches about 6933 feet above sea level. You can take a boat out to the island and hike up to the top. We have never done that. Last time we were here, we did the boat ride all around the lake which was pretty cool. I am still amazed at Crater Lake even as I write up this post. It is simply breathtaking. This used to be Mt. Mazama until it had a massive eruption 7700 years ago. 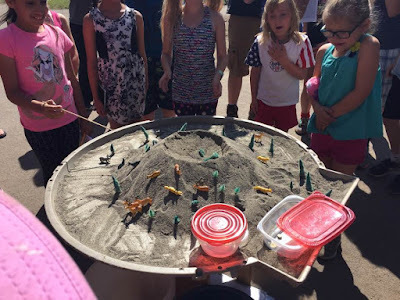 This eruption caused it to collapse and leave a deep basin in its place. The initial blast sent volumes of rock and ash ward skyward reaching as far as Calgary and Nebraska. Flows of hot gas rich lava flooded from new vents encircling the mountain, draining the magma chamber beneath and removing its support, resulting in the mountain's collapse. 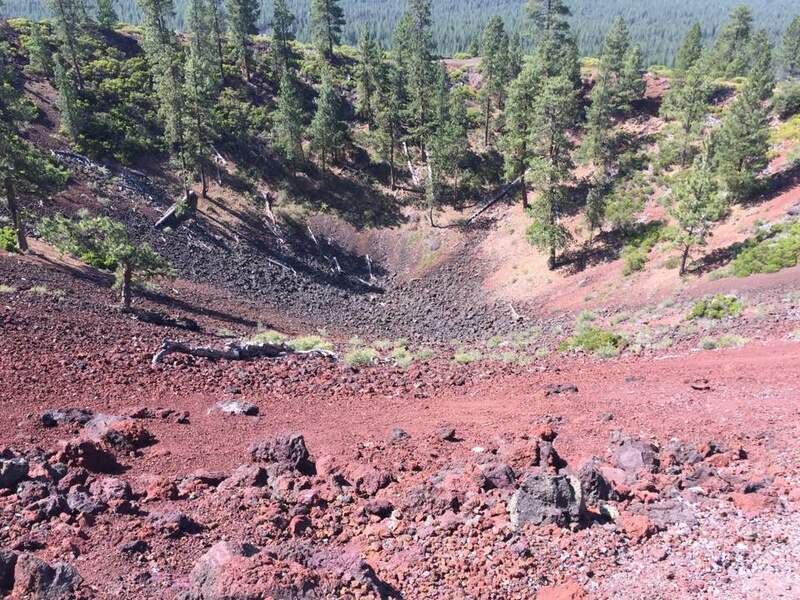 Thick lava then oozed from the volcano, helping to seal the basin that would hold crater lake. In the far right, you can see some rock and it is called Phantom Ship. It is called this because it can only be seen from certain viewpoints. I didn't believe it at first but two trips later and I am as convinced as I possibly could be. Phantom ship is a remnant of one of the mountain's original cones that dates back to 400,000 years ago. 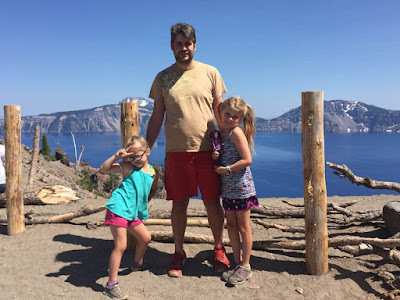 We stayed the night in Crater Lake at one of their campgrounds. 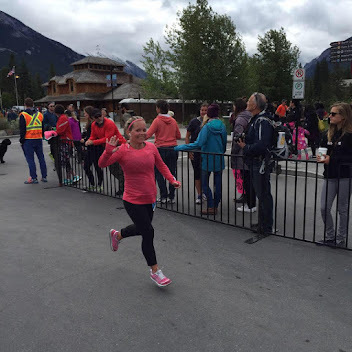 It had the dirtiest bathrooms I have ever seen in any national park both in Canada and United States. Crater Lake was supposed to be our only stop in Oregon this trip but the closest dodge dealership to our next stop in Crescent City, CA was in Brookings, OR which was about 20 minutes from where we were staying. 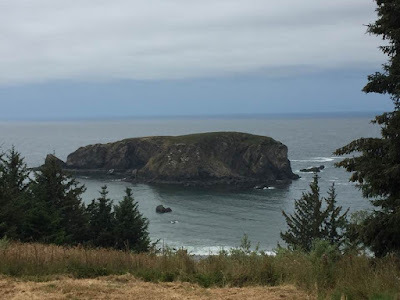 We brought our car in to the dealership on Day 4 and after they diagnosed the problem, we decided to do a portion of the Oregon coast again since our journey wasn't doing great on hills which is a big thing in the redwoods. It turns out it was some sensor that was leaking and it was causing all of sensors/lights to come on and flash. It wasn't serious but when they called and told us about it, they said it was backordered by dodge. 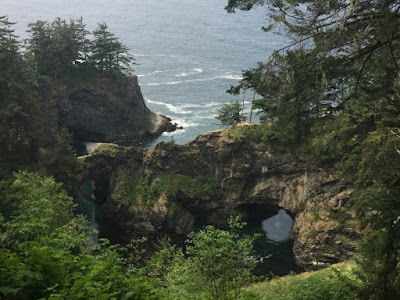 As we walked back to the dealership, we were kinda freaking out about the possible scenarios of what we would do but when we got there they were able to find the part in Portland and would have couriered to them the next morning. It wasn't covered by warranty because it wasn't manufactured by dodge. However, it was only a $45 part and it was going to be $200 all in and only an hour to fix. This was the best news we had heard in days. We were so relieved!!! Searching for tide pools on Harris Beach. It wasn't that cold out but the wind near the water made it feel much cooler. This is from the Natural Bridges Viewpoint which we visited 5 years ago but saw none of the actual bridge due to crazy fogginess. It was really cool this time round. This viewpoint is called Whalehead Point. I don't really see it but maybe others do? While this car problem was more stress then was necessary on any vacation but especially one in another country, it was kinda nice that it was where it was so that we could experience this again without the fog and with the girls being older and now they will remember it. We didn't go all the way down the coast to Portland like last time but it is definitely something I would like to do again in the future.